I’ve been wanting to start posting some notes and sharing experiences with others on the topic of “digital nomadism.” I guess today’s the day. I’m just back to Toronto after spending a few weeks in New York City. This Sunday, I hit the road again. First a month in Vancouver, then a flight to Oaxaca, Mexico where I’ll be living until next spring. Every time I prepare to make a jump from one city to the next – always trying to stay at least four weeks; that’s my general “it’s okay to take a flight” guideline – I ask myself: What’s going to make it into my luggage this time? I try to travel light. 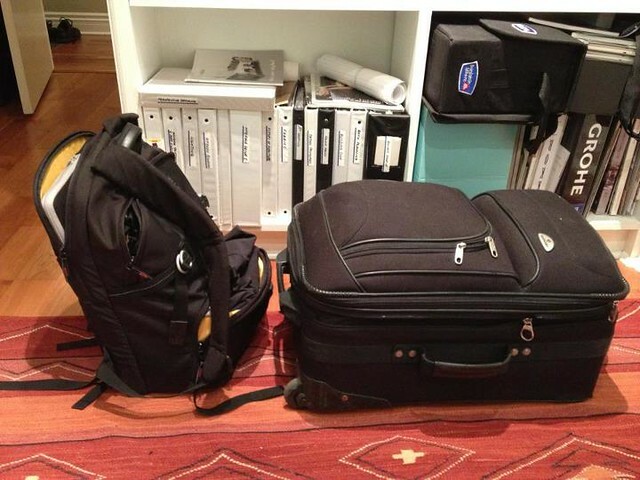 For my first six months in Mexico, I took only one roller suitcase and my awesome Kata laptop/camera backpack. My suitcase is ostensibly carry-on size, but – to be honest – I never have managed to use it in its most compact form that would make it possible to pass-off as carry on. That said, I’m happy with a tiny Heys carry-on for any trip shorter than two months (as long as I’m not going to the Arctic, which is pretty unlikely given how much I dislike being cold). Cooking utilities: Kyocera ceramic knife set: I made this addition in July after visiting the MoMA design shop. Unfortunately, these can’t go into my carry-on luggage for obvious reasons, but – for extended trips – they make all the difference. Permanently sharp and super light weight, they are a must-have for any nomad that doesn’t enjoy eating out every single day of the week. I actually picked up the red-handled ones, which I think are only available separately, in a 3” pairing knife and a 5 1/2” Santuko knife. I believe you can find them at most Whole Foods locations too. Wine utilities: Decanting Pourer and Vacuum Stopper set: This is the latest addition to my nomadic essentials list – also from the MoMA design shop – and a must-have for those of us that prefer wine to beer. Not wanting to appear like a lush, I try to limit my wine intake to a glass or two, at most, whenever I indulge. Thus, a bottle of wine can sit around uncorked for several days. The vacuum stopper keeps that bottle fresh, according to the marketing, for up to six days, and that wine aerator eliminates the need to pack a huge glass decanter. Ergonomic utilities: Ninja Standing Desk: In all honesty, I’ve not had the opportunity to pack this puppy into my suitcase yet, as it just arrived in the mail last week. However, weighing in at less than 4 lbs and packed in its own little carrying case, it will be a cinch to pack in either carry-on or checked luggage. I started working occasionally from a makeshift standing desk in my home about a year ago. It was great, I really enjoyed it, but it was difficult to re-create that experience elsewhere where the area just wouldn’t accommodate a standing desk. And, of course, when I was on the road – in hotels, friends’ homes, and clients’ offices – the options were even more limited. Now I can simply take my ergonomic workstation with me. I think this will be a life changer. Heath utilities: Fitbit Ultra Wireless Activity Plus Sleep Tracker: Stealing an implicit recommendation from the ultra-savvy consumer, Mark Surman, I finally broke down and purchased one of these “quantified self” health devices. I haven’t put it to much use yet, but I’m keen to see how it helps with understanding my sleep patterns (though, I’m sure there are better, dedicated, devices for tracking sleep exclusively) and to have a more accurate record of running and biking activity. The only challenge so far is that it’s so small and easily overlooked that I often forget to attach the darn thing before heading out. Not enough personal data to know if this item is going to make the essentials list yet. Entertainment utilities: Jawbone Jambox, big and small: These portable bluetooth speakers are essential for music-loving nomads. Don’t get me wrong, I always pack a decent pair of headphones for solo listening, but sometimes you want to share the love. I was first introduced to the Jambox by Mr. Ben “Always ahead of the curve” Moskowitz when we had to share a hotel room in Boston some years ago (long story). Unlike Ben, I’ve never managed to get it to work very well for a conference call (the speakers have a built-in microphone for this purpose), but the listening experience provided by these little bricks continues to impress me to this day. This summer I picked up the Big Jambox too: it’s not nearly as carry-on friendly, but for longer trips the downsides of the added weight (4.3 lbs vs. 1.2 lbs) are offset by the incredible sound that this device can bring to a room, or a picnic blanket. For trips longer than a few months, I tend to take both – one for the bedroom and one for the living room. So, fellow nomad, what are the stranger items that make it into your luggage? Drop a list in the comments, or shoot me a note on Twitter.